FAYETTEVILLE, Ark. – The No. 22 Arkansas gymnastics team fell to No. 8 Alabama 196.700-195.800 Friday night inside Barnhill Arena. The Razorbacks were short a competitor as sophomore Sarah Shaffer sat the meet out with an injury. Arkansas again broke the 49 mark on the vault as Sydney McGlone led the Razorbacks with a 9.900 on the event. Freshman Kennedy Hambrick posted a 9.875 en route to a 39.375 all-around score. Fellow freshman Amanda Elswick anchored the rotation with a 9.800. Hambrick led the Razorbacks on bars with a 9.900 which set a new career high for her as the Gymbacks put up their highest score of the season on the event. 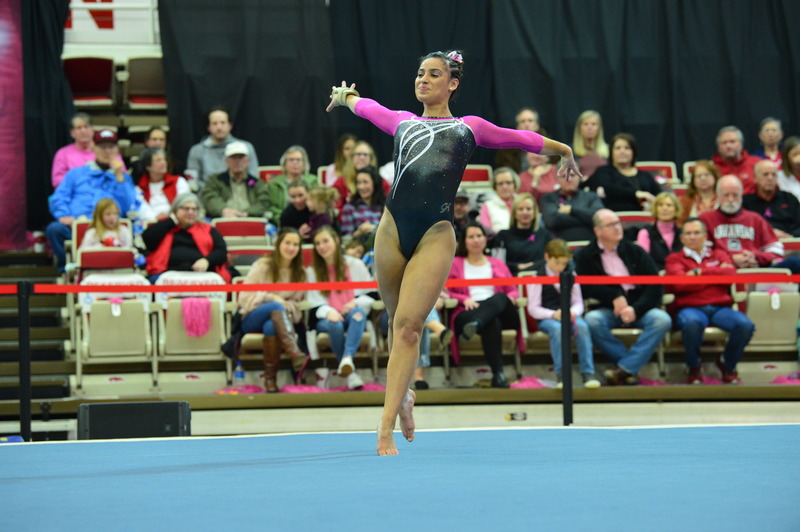 Sophomore Sophia Carter also set a career high with a 9.825 as junior Michaela Burton anchored the rotation with a 9.850. Arkansas started strong on beam with a pair of 9.875’s from Hambrick and junior Jessica Yamzon. Arkansas was forced to count a low score on the rotation as Burton again anchored the rotation with a 9.850. Carter garnered her fifth floor title in six meets with a 9.900 to end the meet for her fourth 9.900 or higher this season on the event. Freshman Savannah Pennese posted a 9.750 in her first appearance in the event as McGlone recorded a 9.875. Arkansas hits the road again to face the Auburn Tigers in Auburn, Ala. The meet is scheduled to begin at 7 p.m. Friday Feb. 15. For more information on Arkansas gymnastics, including in-meet updates, follow @RazorbackGym on Twitter.